So this is really just another way to bake mince pies but I think it’s so clever… I saw Mary Berry create a mince pie streusel where she grated pastry on top of the tray bake and thought I could take this a step further. It’s a little less fiddly than making individual pies and I think it looks so intriguing too. Plus it’s genuinely the easiest thing in the world to make, especially if you’re using shop-bought mincemeat… and quite frankly, why wouldn’t you? 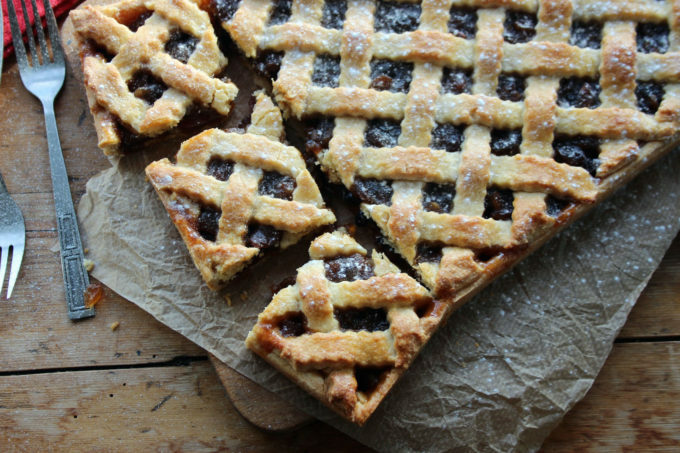 There are some beautiful mincemeats out there, of the one’s i’ve tried, Marks and Spencer do a Prosecco Mincemeat which is divine and Morrisons do a Port and Brandy Mincemeat which is phenomenal and packs quite a punch. 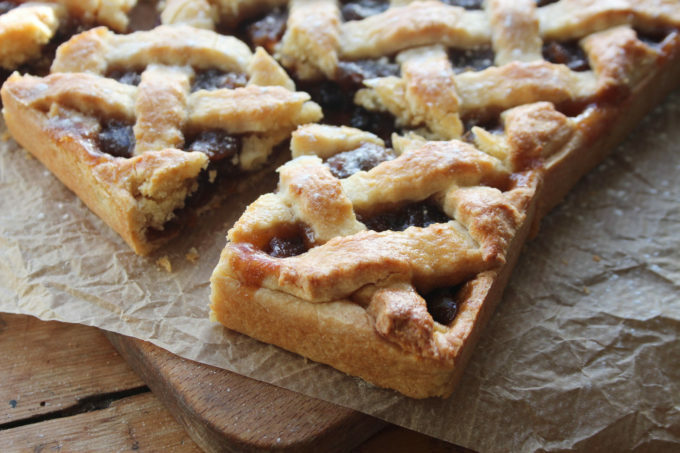 So all you’re really doing here is making pastry and you’ll need a nice robust sweet shortcrust pastry for this traybake as you want to be able to hold the cut squares in your hand without them crumbling. I’ve used my favourite go-to mince pie pastry which has cream cheese and ground almonds in and is quite frankly the best bloody sweet pastry i’ve ever made and ever tasted. It’s inspired by a recipe I found in Dan Lepard’s Short and Sweet so we really have him to thank but if you haven’t made it yet then more fool you. It is incredible. 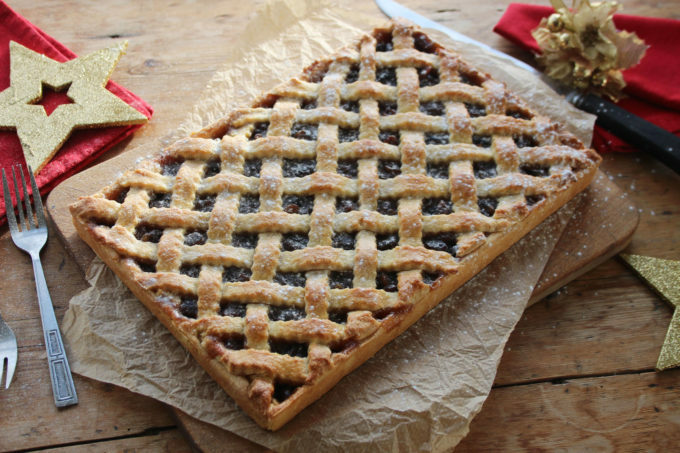 when rolling out use plenty of flour, the pastry is very short and crumbly so be generous with the flour and gentle when you roll… plus the flour will also help with the strips of lattice when weaving them together. 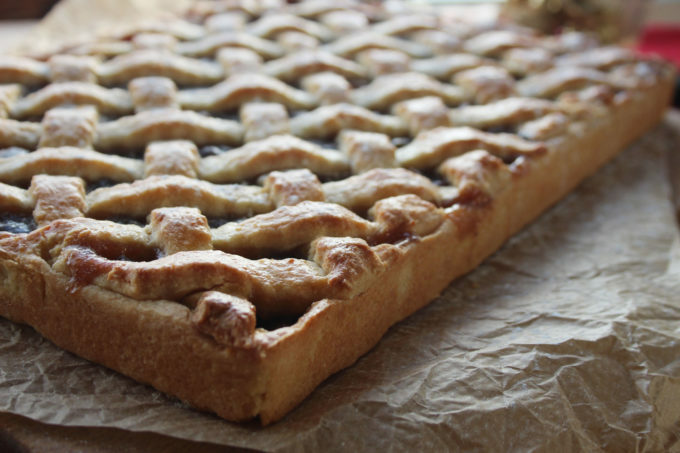 roll out the second half of the pastry so that it’s at least as long as your tray and then cut into thin strips – I used a fluted pastry roller which makes everything not only look pretty but also a lot more professional plus it’s very forgiving when it comes to straight lines. brush the top with an egg wash made from 1 beaten egg mixed with a little milk and then bake at 160C for roughly 20mins or until the pastry is golden. That looks so professional! I can’t even get all my strips the same width when I try lattices. I love this, it looks delicious. That pastry does sound lovely. I’m glad you’ve made your peace with Short and Sweet. I still have nightmares about you-know-what of a few years ago and seem to have a blind spot in the place where it sits, unopened since, on my bookshelf! Thanks Jean… I wouldn’t say ‘made peace’ more ‘just don’t really care because the recipes are great!’ In fact I only ever open it at Christmas for this recipe!